Roses are red, nicknames are pink. Everyone deserves a bouquet for Valentine's Day, and we have you covered. 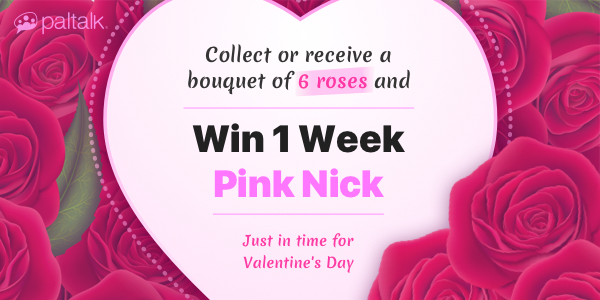 Collect all six special roses* from the "Collect and Win" category to make a bouquet and win a 1 Week Pink Nickname! You must collect all 6 unique roses from the category marked "Collect and Win" to win the nickname prize. Plus, every additional set you collect earns you an additional week. Send a rose to someone special or treat yourself. Runs until Friday, 8 February 2019 to Valentine's Day, 14 February 2019. Contest rules subject to change.